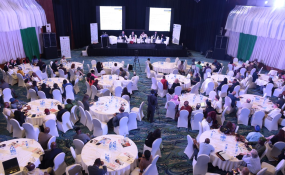 Under the title "Why Good Journalism Matters: Quality Media for Strong Societies", the 2018 IPI World Congress was held in Abuja, Nigeria, from June 21 to 23, 2018. United Nations — Violence and toxic rhetoric against journalists must stop, say United Nations experts. Marking the International Day to End Impunity for Crimes Against Journalists, U.N. Special Rapporteurs David Kaye, Agnes Callamard, and Bernard Duhaime expressed concern over the plight that journalists are increasingly facing. "Journalists around the world face threats and attacks, often instigated by government officials, organised crime, or terrorist groups," their joint statement said. "These last weeks have demonstrated once again the toxic nature and outsized reach of political incitement against journalists, and we demand that it stop," they added. While Saudi journalist Jamal Khashoggi's brutal death and the subsequent lack of accountability has dominated headlines, such cases are sadly a common occurrence. According to the U.N. Educational, Scientific, and Cultural Organization (UNESCO), 1010 journalists have been killed in the last 12 years. Nine out of ten such cases remain unsolved. Latin America and the Caribbean has among the highest rates of journalists killed and impunity in those cases. Between 2006-2017, only 18 percent of cases of murdered journalists were reported as resolved in the region. In the Committee to Protect Journalists' (CPJ) annual impunity index, Brazil, Mexico, and Colombia make the top 14 countries in the world with the worst records of prosecuting perpetrators. Out of the 14 journalists murdered in Mexico in 2017, there have been arrests in just two cases. In an effort to raise awareness of crimes against journalists, UNESCO has launched the #TruthNeverDies campaign, publicising the stories of journalists who were killed for their work. "It is our responsibility to ensure that crimes against journalists do not go unpunished," said UNESCO's Director-General Audrey Azoulay said. "We must see to it that journalists can work in safe conditions which allow a free and pluralistic press to flourish. Only in such an environment will we be able to create societies which are just, peaceful and truly forward-looking," she added. Among the journalists spotlighted in the campaign is Paul Rivas, an Ecuadorian photographer who travelled to Colombia with his team to investigate drug-related border violence. They were reportedly abducted and killed by a drug trafficking group in April, and still little is known about what happened. Similarly, Mexican journalist Miroslava Breach Valducea was shot eight times outside her home, and gunmen left a note saying: "For being a loud-mouth." She reported on organised crime, drug-trafficking and corruption for a national newspaper. U.N. experts Kaye, Callamard and Duhaime urged states to conduct impartial, prompt and thorough investigations, including international investigation when necessary. "Staes have not responded adequately to these crimes against journalists... impunity for crimes against journalists triggers further violence and attacks," they said. They also highlighted the role that political leaders themselves play in inciting violence, framing reporters as "enemies of the people" or "terrorists." Recently, over 200 journalists denounced President Donald Trump's attacks on the media in an open letter, accusing him of condoning and inciting violence against the press. "Trump's condoning of political violence is part of a sustained pattern of attack on a free press -- which includes labelling any reportage he doesn't like as 'fake news' and barring reporters and news organisations whom he wishes to punish from press briefings and events," the letter stated. The letter came amid Trump's comments during a rally which seemingly praised politician Greg Gianforte who assaulted Guardian reporter Ben Jacobs in May 2017. "Any guy who can do a body slam, he's my kind of--he's my guy," he told supporters. Similar rhetoric is now being used around the world, including in Southeast Asian countries where the "fake news" catchphrase is being used to hide or justify violence. For instance, when speaking to the Human Rights Council, Philippine senator Alan Peter Cayetano denied the scale of extrajudicial killings in the country and claimed that any contrary reports are "alternative facts." "We call on all leaders worldwide to end their role in the incitement of hatred and violence against the media," the rapporteurs' joint statement concluded.